Who was Obama’s ‘hype man’ last night? H/T to TVOne‘s Roland Martin for alerting Team Obama to the need for a pre-debate ‘hype man’ because the President walked onto center stage last night with a winning ‘tude. The President took those words to heart. He had his game face on. His eyes were lit up and he paced about the Hofstra University stage with confidence and ready to engage. At one point, I thought Obama was going to “sack” Romney when Mitt’s rhetorical pocket collapsed during one sharp exchange. I heard Lewis’ voice ringing in Obama’s ear when he laid the smackdown on Mitt for mischaracterizing the President and his Administration as misleading the nation on the 9/11 attack on the US Mission in Benghazi, Libya that left four Americans, including the US Ambassador, dead. And again, during his closing response President Obama demolished Mitt Romney’s economic prescriptions and his apparent disdain for 47% of the American electorate. Mr. Obama proved that he is “not OK with mediocre” in himself, his opponent or the nation’s economy. 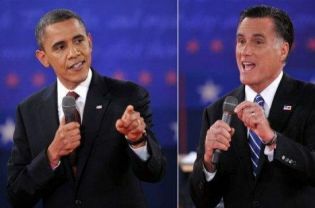 1 Response to Who was Obama’s ‘hype man’ last night?